What's the secret to a perfect apple pie? Pink Lady apples! This delicious variety of apples is great for baking and deliver just the right amount of tart and sweet flavors that make apple America's favorite pie. 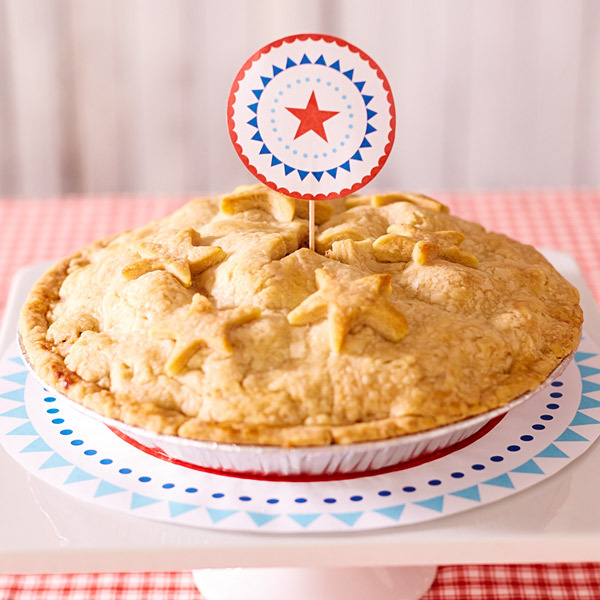 Our easy apple pie recipe features store-bought piecrust, Pink Lady apples, sugar, nutmeg, ground cloves and cinnamon applesauce under a star-spangled top. Our five-star recipe for this all-star American dessert will have have your guests celebrating well before the fireworks start! To make the filling: Wash and peel skin from apples. Cut apples into 1- to 2-inch chunks, leaving the core. Slide the apple chunks into a mixing bowl. Sprinkle with the sugar, 3 tablespoons of flour, nutmeg, cinnamon and cloves, then stir until apple chunks are coated with the dry ingredients. Cut the lemon into squeezable fourths. Squeeze the lemon juice from each slice onto the apples (watch for seeds or remove lemon seeds before squeezing). Add the cinnamon applesauce to the apple chunks and stir until coated. To make the bottom crust: Sprinkle a little flour onto your clean work surface. Roll dough an inch larger than your pie pan (Tip: Turn your pie pan upside down, lay it on top of the dough and trim the edge). Save the dough scraps. Press the pie dough firmly into the bottom of the pan working your way up to the edge. Trim dough again if necessary. Set aside. To make the top crust: Sprinkle a little more flour onto your now doughy work surface. Roll out the second piece of dough just as you did the first. In the center of the dough cut one star with a small to medium star-shaped cookie cutter. Using a slotted mixing spoon, scoop apple slices into the bottom piecrust. (There might be apple juice in the bowl; leave the extra liquid behind and take only the apple chunks.) Cut the tablespoon of butter into pieces and scatter on top of the apples. Gently use a spatula to pry the top crust from the work surface. Using both hands, drape the top crust with the star in the center. Trim extra dough from the edge then pinch the two edges together. Combine all dough scraps into a ball and roll out on work surface. Cut additional stars and softly press them on the top crust around the star in the middle. Brush with milk. Bake for an hour or until crust turns golden brown and the filling bubbles. Let cool completely before serving.